We use this page to collect miscellaneous thoughts and events. Currently we're highlighting Barbara's writing career. Barbara saw her dream come true when her manuscript was picked up by a New York literary agent. It sold to Berkley Books in four days and was published in November 2008. The book continues to sell and currently is in the top 1% - 2% of sales on Amazon.com. Barbara maintains a website for her book www.adancewiththedevil.com. Visit her there for more details about psychopaths, domestic violence, recovery, political advocacy, and writing. Working with a New York publisher was an exciting experience. Besides editing text, there were photographs to be provided, permissions to obtain, and a book cover and title to agree upon. Barbara was in China and Japan for part of this crucial activity and she was ssurprised to get an email saying the publisher wanted to change the name of the book from "The Admiral's Wife" to "The Devil I Knew." The change was not a problem, but Barbara did not like the suggested title. The publisher said they wanted to use the word "devil" to denote "evil" so Barbara sat in a traditional Chinese tea house and scribbled names on a paper napkin until she came up with "A Dance with the Devil." Barbara works hard to educate the public about psychopaths and the pitfalls of domestic violence. She has been asked to speak to groups and organizations numbering from four to four hundred. She led a workshop titled "From Victim to Victor" for a women's day long event. 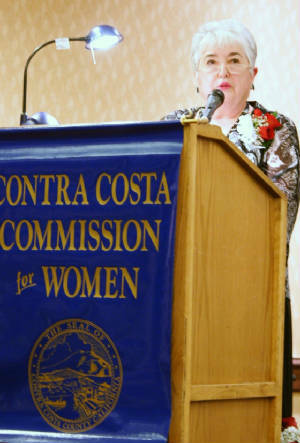 In 2009 Barbara was honored to be the keynote speaker for the Contra Costa Commission for Women's annual Hall of Fame Awards. In my right hand I'm holding my contract from Penguin USA. The signatures of the company's president and vice-president are right abouve mine! In my left hand I'm holding my first check of my negotiated advance. I was excited to claim that I was a paid author. Cool! It was proof that my passion, planning, patience, and persistence saw me through the process from first deciding to write the book in 1991 to getting a New York publisher in 2006. I actually started writing in 1994 while attending the Write It Sell It workshop in Bristol, Connecticut. Now I've finished a second book on success and am starting a historical novel titled "Becoming Irish." Many people tell me they've written a book. When I ask if they've taken writing classes and they say no I remind them that you can't sit down at a piano for the first time and pound out Mozart. The good news is that with passion, planning, patience, and persistence, you can learn to write. 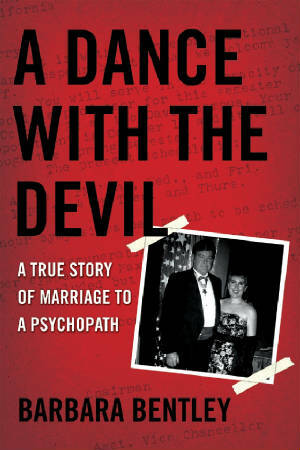 To learn more about how I did it, visit my web-page www.adancewiththedevil.com and click on Writing. One of the reasons for the continued popularity of Barbara's book is the TV exposure she's received since 2003. Her first experience was being a 15 minute story for the 2003 Lifetime TV show "Final Justice" hosted by Erin Brockovich. After the book was published, Dateline NBC contacted her. They did a one hour story that first aired on Sunday, June 6, 2009, at 8 pm! Prime-time! It has been shown multiple times and it can now be seen on the Investigation Discovery channel. In the summer of 2010 a Canadian TV production company (part of the interview in this photo) came down and did a one hour story for their series "The Devil You Know." Barbara's segment was titled "Devil in Disguise" and it appeared on the VIVA channel in Canada in October, November, and December. Negotiations are underway for the series to appear on a channel in the United States in the summer of 2011. 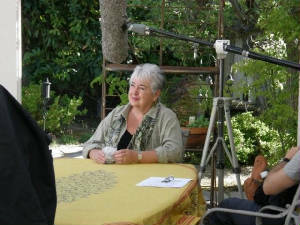 In February the production company for the half-hour show "Who the Bleep Did I Marry" taped an interview with Barbara and the show will appear on the Investigation Channel in 2011. There is also interest from a producer/screenwriter to pitch Barbara's story for a TV movie to Lifetime and Hallmark. Barbara has worked hard to publicize her book. She's done book signings and talks at major bookstore chains and independent booksellers. 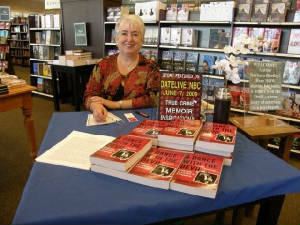 Here she's pictured at the Barnes & Noble in Bend, Oregon. She's also done many radio shows, newspaper interviews, and has even posted two YouTube videos. 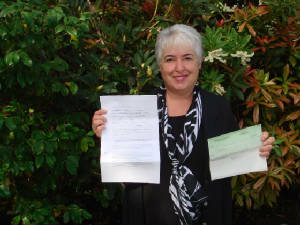 Barbara wrote her book to help others and she continues to receive emails from women and men from around the world asking for her help and advice. She has set up her web-page www.adancewiththedevil.comto be a source of information for those in need. Women write that her book has changed their lives and she has given them hope to carry on as they try to rid themselves from the psychopaths or sociopaths in their lives. She's also been told on more than one occasion that her law has helped them in a divorce situation. Barbara also does speeches for groups like the Chamber of Commerce, Rotary, International Women's Writing Guild, and the Association of American University Women. She does outreach with her Twitter account @BarbaraBentley and has 11,500 followers. Barbara can now say she's an international author. Her book was published in Poland in 2010. The publisher did not pay for photo rights so they are not included in the Polish version. Apparently a foreign publisher also designs their own cover to reach their target audience. This one looks more like a romance novel that a true crime/memoir! The English version of Barbara's book has sold not only in the United States, but also in Canada, Australia, England, and Ireland. 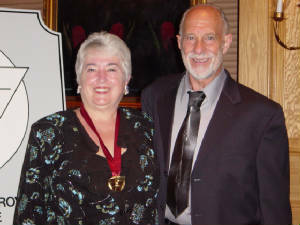 In 2009, Barbara was honored as the recipient of the Paul H. Chapman Award from the Foundation for Improvement of Justice located in Atlanta, Georgia, for her efforts in Legal Reform (for changing the no-fault divorce law of California). The award came with an all-expense paid trip for four back to the ceremony, a $10,000 check, and the Paul H. Chapman medal. A bonus during the trip to Atlanta was to get to see the FedEx Cup finals at an Atlanta golf course. That's why my face is so red in this photo -- I got sunburned at the golf tournament! 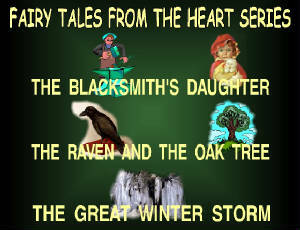 Barbara finished her Fairy Tale form the Heart Series about the Blacksmith's Daughter, who lives in a dry dusty prairie town than changes along with her through her adventures. Illustrations for the first two are complete and she needs to get the watercolors out to color in the drawings for The Great Winter Storm. Barbara has queried many agents but so far not one has been interested. With the changing publishing world and the e-book phenomena, Barbara may just go ahead and publish directly to Kindle, Nook, and I-Pod.